The discovery of pervasive transcription in eukaryotic genomes provided one of many surprising (and perhaps most surprising) findings of the genomic era and led to the uncovering of a large number of previously unstudied transcriptional events. This pervasive transcription leads to the production of large numbers of noncoding RNAs (ncRNAs) and thus opened the window to study these diverse, abundant transcripts of unclear relevance and unknown function. Since that discovery, recent advances in high-throughput sequencing technologies have identified a large collection of ncRNAs, from microRNAs to long noncoding RNAs (lncRNAs). Subsequent discoveries have shown that many lncRNAs play important roles in various eukaryotic processes; these discoveries have profoundly altered our understanding of the regulation of eukaryotic gene expression. Although the identification of ncRNAs has become a standard experimental approach, the functional characterization of these diverse ncRNAs remains a major challenge. 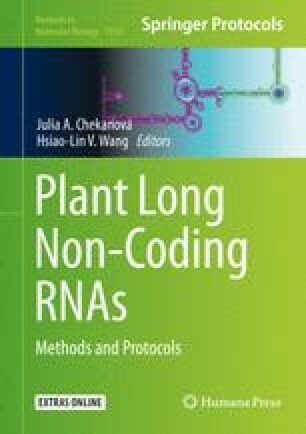 In this chapter, we highlight recent progress in the methods to identify lncRNAs and the techniques to study the molecular function of these lncRNAs and the application of these techniques to the study of plant lncRNAs.